WASHINGTON, DC, August 12, 2011 (ENS) – Some 12.4 million people in the drought-hit Horn of Africa – Djibouti, Ethiopia, Kenya and Somalia – are facing severe food and water shortages and need international emergency assistance to survive. The region is facing the worst drought in 60 years. The United Nations refugee agency said today it urgently needs 45,000 more tents as more Somalis continue to arrive in Kenya after fleeing drought, famine and conflict in their homeland. More than 70,000 Somali refugees have arrived at the three camps that make up Kenya’s Dadaab refugee complex during June and July, bringing the overall population there to 440,000, according to the UN High Commissioner for Refugees, UNHCR. “As well as needing food and water, these new arrivals urgently need proper shelter, medical help and other basic services,” UNHCR spokesperson Adrian Edwards told a news conference in Geneva. The agency has moved thousands of tents to Dadaab since the current crisis began but the growing refugee population needs even more. At least 3.7 million people, nearly half the Somali population, are now directly at risk of famine and tens of thousands have already perished. 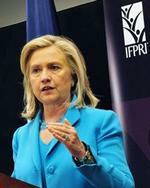 “What is happening in the Horn of Africa is the most severe humanitarian emergency in the world today, and the worst that East Africa has seen in several decades,” Secretary of State Hillary Rodham Clinton told an audience at the International Food Policy Research Institute in Washington Thursday. On Monday, President Barack Obama announced that in view of the current crisis, the United States is providing an additional $105 million in emergency funding. 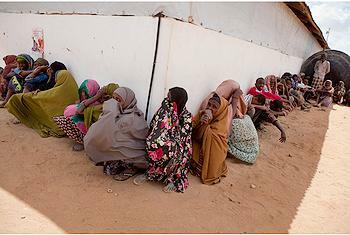 Still, hundreds of thousands of Somalis, largely women and children, are fleeing to the north – crossing the borders into Ethiopia, Kenya, and Djibouti – straining the capacity of those countries. 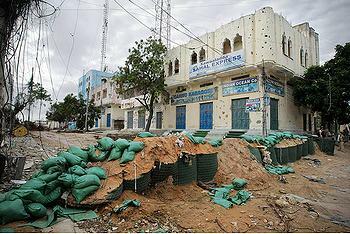 Al-Shabaab, which has fought for four-years to remove the Western-backed government of Somali President Sheikh Sharif Sheikh Ahmed, withdrew its forces from the capital, Mogadishu, on August 6. Thousands of Burundian and Ugandan African Union troops, which support the Somali Transitional Federal Government, now control over 90 percent of the city since al-Shabaab’s retreat. This week, Dr. Jill Biden, wife of Vice President Joe Biden, visited Kenya to draw attention to the humanitarian crisis. She led a delegation that included physician and former U.S. Senator Bill Frist, a Tennessee Republican; U.S. Agency for International Development Administrator Raj Shah; Assistant Secretary of State Eric Schwartz; and Special Assistant to the President Gayle Smith. “We learned of families who had arrived too late whose children became part of a devastating statistic: in the past three months alone, 29,000 children younger than 5 have died of starvation,” they wrote. “Dadaab is now the fourth largest city in Kenya, home to more than 370,000 people who were in such a state of need that they fled their homes, many on foot, many from hundreds of miles away, just to find food, water, and health care for themselves and their children,” said Shah. For years, said Shah, the United States has been working with the Ethiopian government on a safety net program that has improved food security for many living in areas vulnerable to drought. “Even in this record drought, due to that long-term effort, 8.3 million people that have benefited from this program today do not need emergency assistance,” he said. President Obama’s Feed the Future initiative partners with countries like Ethiopia and Kenya to develop their own agricultural industries, helping them break free of the need for humanitarian food aid. During her visit, Dr. Biden toured the Kenya Agriculture Research Institute in Nairobi, which receives USAID funding to help develop drought-resistant crops and improve farming methods to increase yields. UN Under-Secretary-General for Humanitarian Affairs Valerie Amos arrives in Kenya today to meet with humanitarian agencies that are responding to the crisis and to visit refugees at Dadaab. The second of three planned humanitarian flights landed at Mogadishu airport on Thursday, bringing a 32-ton consignment of shelter and other aid items, said the UN High Commission for Refugees, UNHCR. The agency has been shipping relief supplies to Mogadishu by sea and land, but due to the large number of people seeking help in the city after fleeing their famine-hit villages in the south, it decided to airlift supplies to save time. 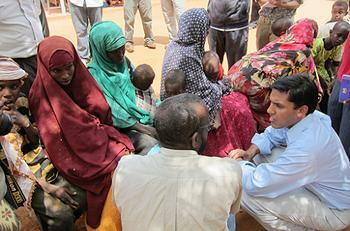 In July, the United Nations declared a famine in five southern regions of Somalia, including Mogadishu. 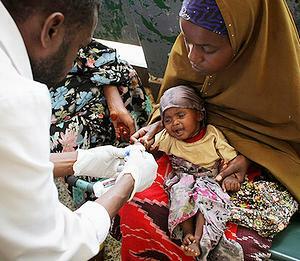 UN agencies are stepping up efforts to respond to a cholera epidemic among the displaced Somalis who have arrived in the capital, Mogadishu. The UN World Health Organization said 181 people have died from suspected cholera cases in a single hospital in Mogadishu this year and there have been several other confirmed cholera outbreaks across the country. “Most [outbreaks] have been declared under control, but alarming rates of confirmed cholera cases among internally displaced people have been reported in Mogadishu,” WHO spokesperson Tarek Jasarevic told reporters in Geneva today. An estimated 100,000 Somalis have fled to Mogadishu over the past two months in search of food, water, shelter and protection in addition to the more than 370,000 internally displaced persons in Mogadishu who were forced to leave their homes before the current wave of displacement. UN Secretary-General Ban Ki-moon Thursay discussed the need to mobilize international resources to counter famine in the Horn of Africa with Irish rock star Bono, a leader of the multi-partner Campaign ONE, which fights extreme poverty and preventable diseases in the world’s poorest places. In a phone conversation, they discussed the need to galvanize fund-raising efforts and to improve access for humanitarian workers to deliver aid, and agreed on the importance of supporting political dialogue in Somalia. “We’re also paying attention to the environmental impact of our programs to protect the water and the land for future generations and to help farmers adapt to the effects of climate change,” she said.